Compatible with: iPhone, iPod touch, iPad. Optimized for iPhone 5. 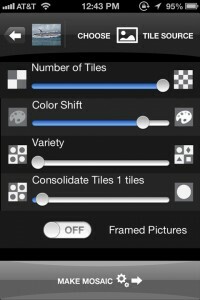 Looking for a fun, inexpensive way to create mosaics on your iDevices? Take a look at mymosaic. The creation process is pretty straightforward. The first thing mymosaic does when opened is scan your photo library. This may take a few minutes depending on the size of your library. Next, choose a photo you’d like converted into a mosaic. You can either take a new photo or use an existing one. Then click the mosaic button at the bottom of the screen. Here you’ll select which albums will be used to create the mosaic. Make a few adjustments to the sliders shown, then press the Make Mosaic button. Give mymosaic a few minutes to work its magic. The more photos you want in the mosaic the longer it will take to create. A mosaic I made of a landscape using over 7000 photos took just under four minutes to complete on my iPad. Also, make sure the app is open and your device doesn’t go to sleep, or the process stops. The more variety of photos you choose the better the final product. Finished mosaics are saved to the camera roll in one of four sizes: Mobile, Small (10″x10″), Medium (20″x20″), or Large (30″x30″). Yes, that’s inches. Files are saved at 300 dpi for printing (except mobile), and are quite large, anywhere from 25-40MB. Most printing would be poster sized and done by a printing shop. I used mymosaic on my iPad with Retina display. Zooming in on the finished product and seeing all the photos used to make the mosaic was amazing. Mosaics can be shared on Twitter, Tumblr, Facebook, and Flickr. I tested uploading the above mentioned landscape mosaic to Facebook; it worked beautifully and took less than two minutes. The same mosaic downloaded from Facebook was much smaller size than what’s saved to the camera roll: only 946KB in this case. However, printing it on my home printer gave less than quality results. 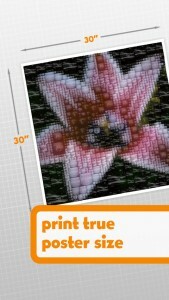 Anything created with mymosaic that you want printed should be printed at a printing shop. Unfortunately there’s no email option within the app; hopefully that will be addressed in future versions as a convenience. 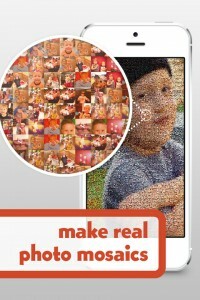 If not, attach a mosaic to an email as you would any other picture. Overall, mymosaic is fun way to use all those photos sitting in your photo library. Printed mosaics will make a great holiday gift, one you know won’t be re-gifted!